I adapted this mini-album from instructions on the website from SU. 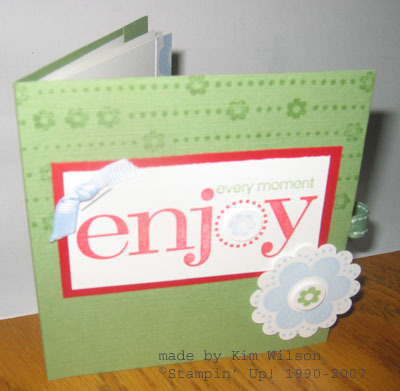 It has 14 pages and uses the Wild Wasabi Cardstock offer, Enjoy Every Moment stamp set and Daisy Dash wheel. Don’t forget that you can get FREE WHEELS this month! Contact me soon with your order, as the Wasabi CS offer is almost depleted! I am making some extra albums to sell – $10 includes postage! Contact me to order.